Please note: the VMeter is now out of production. We may do another run if there's enough interest, but for now there is no eta. Please let us know if you're interested and if we get enough people, we'll do a crowd sale supported run. If you're an owner, don't worry, we're still offering full support. Did you know? The VMeter is fully opensource, from software through hardware. Feel free to build your own, modify, or use the design as part of another instrument! 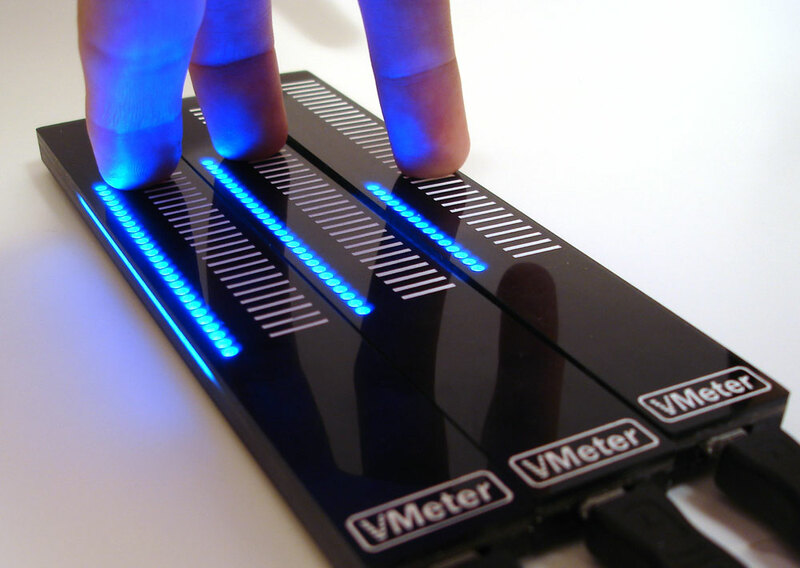 VMeter™ is a USB MIDI touch strip that provides nuanced musical control and visualization for DJs and other laptop musicians. 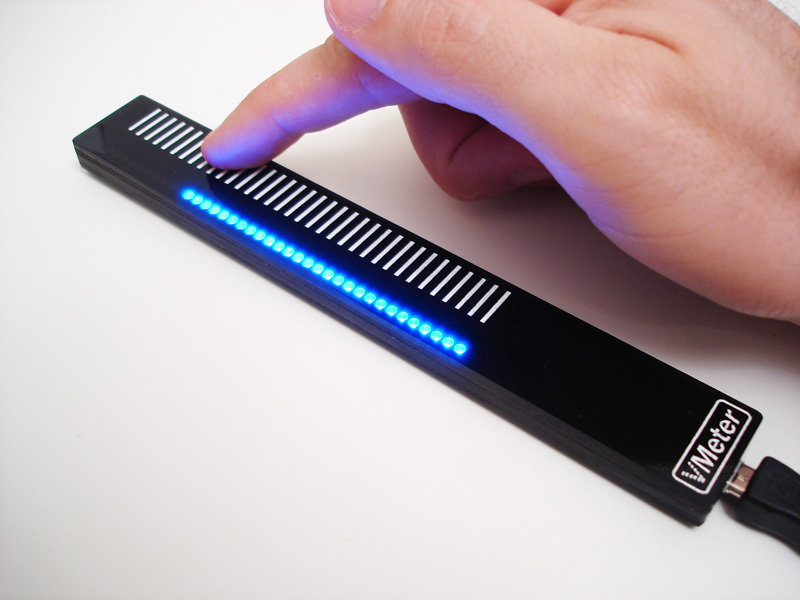 Blue LEDs react to volume, touch or MIDI. The versatile touch strip is actually several controllers in one, giving you new ways to "play" effects and tracks. Multiple controllers in one provide anything from simple track fader to sophisticated virtual instrument controller. 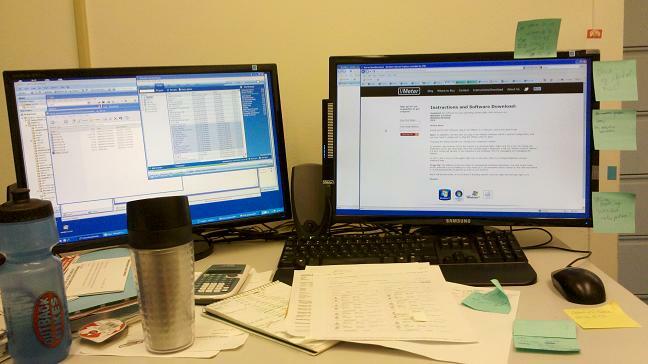 Control Windows XP, 7 and OS X system volume. See instructions for download. NEW: VU Meter display of sound levels and cpu usage meter (Vista+ only). Super responsive touch strip for fast reactions, including ability to snap to new levels. 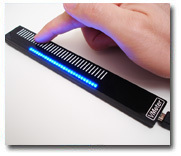 Blue LEDs can act like a VU meter, touch tracker, or even MIDI envelopes for animation. Dimmable. 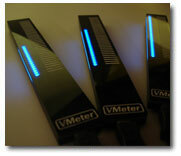 Unlimited number of VMeters can be connected through powered USB hubs. 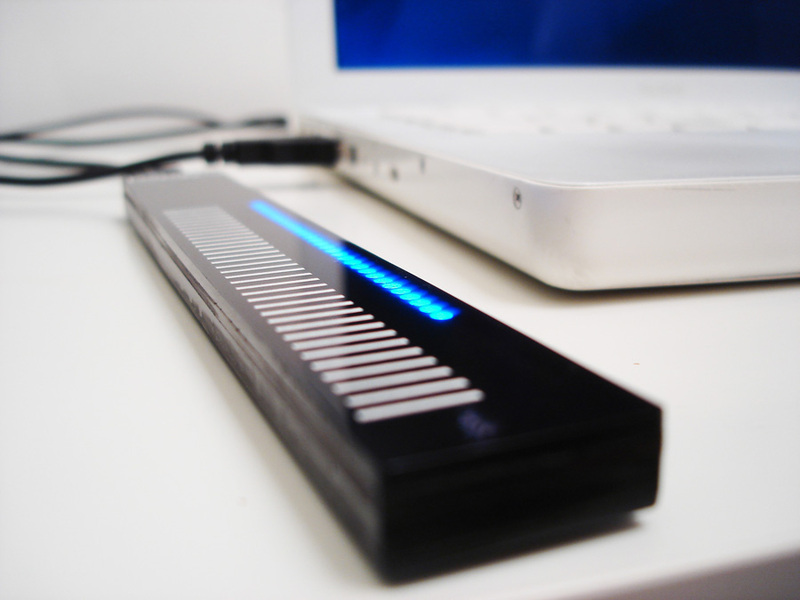 Native USB MIDI controller--control any music software without drivers, Win/Mac/Linux. Programmers: use as a generic I/O device. Python tutorial and demos. 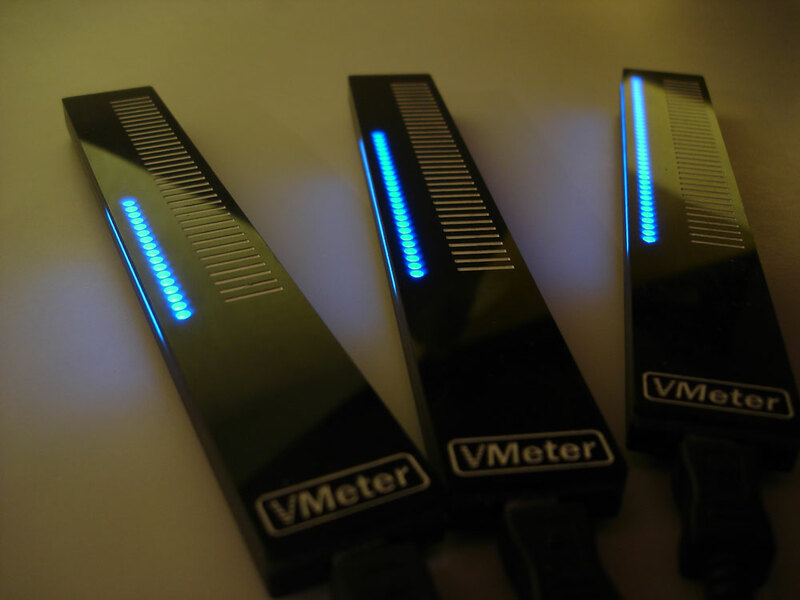 The VMeter is a class compliant USB MIDI Device, which means that just about all software can receive data from it. Some software does not send data back out, so mouse changes to faders and automation don't playback on all software. Here is a brief summary of testing, see the tutorials & compatibility page for more details. Ableton Live: Control any knob, VU Meter output with special plugins. LMMS: Control any knob, fader or instrument. VMeter --> LMMS only. Torq DJ Software: Full bi-directional support + VU outputs. Reason: Control any knob or fader, VMeter --> Reason only. Cockos Reaper: Anything can be controlled via Actions, visual feedback only for MIDI track recordings. Sonar X1: Control any knob or fader, VMeter --> Sonar only. New: can be used as a visual metronome. Logic Pro: Control any knob or fader, VMeter --> Logic only. Cubase: Full bi-directional support, limited VU Meter. Presonus Studio One: Full bi-directional support. Automation and mouse-changes show up on VMeter(s). Resolume (Video DJ Software): Control any knob or fader, VMeter --> Resolume only. Pitch wheel mode not supported. ProTools: Very minimal support. The fader controller numbers are hard-coded to 33-40, and pans on those tracks are hard-coded to 17-24. Some plugins let you "learn" a mapping, but not all plugins. No output back to VMeter(s). GarageBand: Extremely minimal support. Volume and Pan control over currently selected track only. Standard Keyboards: Unless your manual specifically says "USB Host", it's very unlikely that you can plug in a VMeter directly. However, the Kenton MIDI USB Hostbridge is an option. Volume control for PC / MAC: Hardware version A can be "downgraded" to our original firmware that let's the VMeter act as a volume control on a computer. Contact us if you'd like it. "I assigned it to one track in Logic, using the location on the strip to control the panning like a pot, and the touch sensitivity to control the spread of the signal. It was pretty awesome! 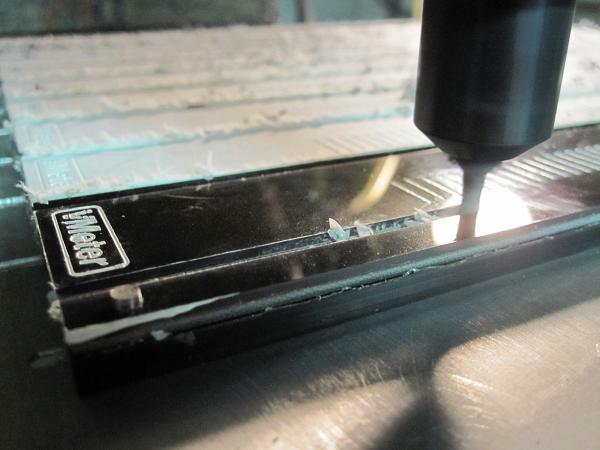 It's part of my toolbox now." "I use mine with orchestral libraries and the ability to simultaneously adjust expression and other parameters (for example Vibrato depth with LA Scoring Strings) is fantastic... I know lots of film composers who get very frustrated with the limitations of the Mod wheel." 5min demonstration of pressure sensitivity, pitch wheel, config utility. Thanks to the Ableton Colorado User Group for some early prototype feedback and suggestions! 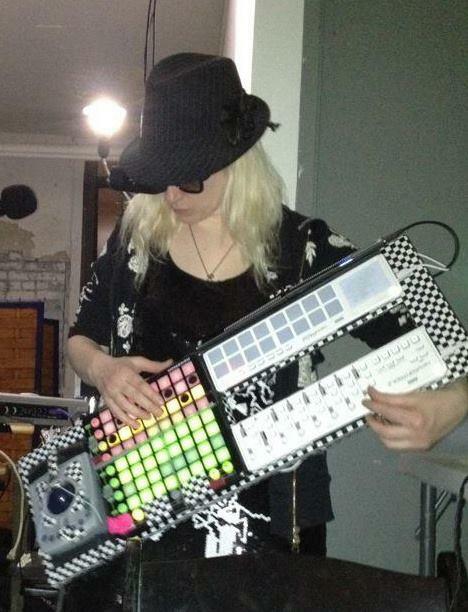 Synthonie from Bonn, Germany, presents the MUSITAR. Stephen G's home studio. "...the perfect accompaniment to the other controllers. Carefully resting on it’s own aluminium and leather stand - the best way to get a modulation wheel with a decent piano action"
"I use the vMeter as either a mod wheel or pitch bender for virtual instruments hosted in Cubase 5. My Yamaha S90 keyboard controller has it's wheels mounted in a difficult to reach place and having the vMeter hard mounted to the left end of my computer keyboard tray is perfectly ergonomic for when I'm playing VSTi's. I'm a realtime player not a "draw the notes on the screen" kind of guy so being able to control vibrato or other expressive parameters is key. I also really like the feel of the vMeter as well as the visual feedback. It's just a truly elegant controller. :)"
VMeter is now at ThinkGeek! Mark Wingfield interview on guitar moderne about pushing the boundary of guitar sounds. He uses the VMeter on guitar for parameter manipulation. Ariel in Argentina explains how he uses the VMeter with Sonar as a visual metronome when performing. Torley demos new adjustable speed pitch return. Thanks! 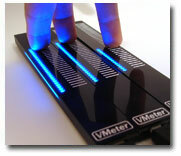 Wireless and wearable VMeter by astlab. New firmware with adjustable pitch bend return speed, adjustable sensitivity, and minor bug fixes. Require the latest config utility. VMeter + Arduino as sensor display and servo input. Tutorial. VMeter can now act as VU Meter for realtime sound level display, or CPU Usage monitor. (Vista+ only). See instructions for downloads. Non-music demos using python: Game of Life, Binary Clock, CPU Monitor, Chases, etc. New firmware, fixes bugs, supports Note Out LED control to enable "Visual Metronome." "...The touch sensitivity is great and works incredibly well, even giving the ability to jump to higher or lower levels instantly..."
New computer-side software allows VMeter to control Win XP, 7 and OS X system volume. 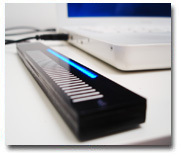 Now control regular MIDI keyboards using the Kenton USB MIDI Host converter. Rhythm Active in Australia now carries the VMeter, and a bunch of other awesome synths, modulars, other cutting edge music tech. Review in "Audio Video & Music" (Italian publication), p. 36. (warning: it's a huge pdf!). Thanks noisecollective.net! Having sold out for a while due to some large distributor orders, we've finally got stock again! Film composer Jon Wygens also gave us some great feedback on being able to use position and pressure at the same time. A new VMeter review on digital recording arts. "A USB MIDI Controller for Everyone"
Our second European distributor, bax-shop.nl, now has stock! They're currently offering free shipping for many places in Europe. Julie (DJ Shakey) integrates some VMeters into an impressive build for NY's Clocktower Gallery. Controllerism.com includes VMeter in holiday gift guide. "The sensitivity on it is amazing"
New tutorial on using the VMeter as a track volume display (VU Meter) in Ableton Live. Major new firmware with tons of new features! PC MIDI software now available. MAC MIDI software first release, let us know about any features you'd like to see. Chances are we'll be able to get them into the next update. 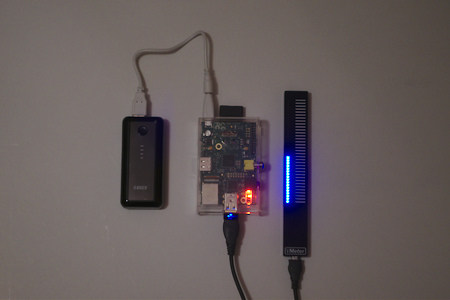 janw's binary clock using the 0.19 firmware & USB HID Interface - low level hacking!